Flush your cheeks and tint your lips with the Benefit Benetint - Rose Tinted Lip & Cheek Stain, a non-drying formula that is longlasting. The Benefit Benetint – Rose Tinted Lip & Cheek Stain has a lot of history. First launched as ‘Rose Tint’ back in 1977, the famous formula has now become an iconic beauty item that is loved worldwide. Designed to last, the rose-tinted formula kisses the lips and cheeks with sheer colour that makes the complexion look radiant and healthy. The Benetint - Rose Tinted Lip & Cheek Stain is your blusher and lip colour in one. It can be used underneath lipstick or lip gloss to increase colour intensity. Brush three strokes on-to the apples of the cheek, then blend with the fingertip. Apply on lips and blend. For a deeper hue, repeat. WATER (AQUA), POLYSORBATE 20, PHENOXYETHANOL, SODIUM HYDROXIDE, CARMINE (CI 75470), METHYLPARABEN, FRAGRANCE (PARFUM), TETRASODIUM EDTA, GERANIOL, LINALOOL, HEXYL CINNAMAL, CITRONELLOL, MALTODEXTRIN, BENZYL SALICYLATE, BHT. N?? 00N12802 Please read the ingredient list on the packaging of your product to be sure that the ingredients are appropriate for your personal use. FREE* Benefit Bronze & Go Go Glow Makeup Pouch when you purchase any Benefit products**. *One FREE Benefit Bronze & Go Go Glow Makeup Pouch per order. **While stocks last. Excludes Minis. This product will be added to your basket automatically if your order qualifies for a free gift. 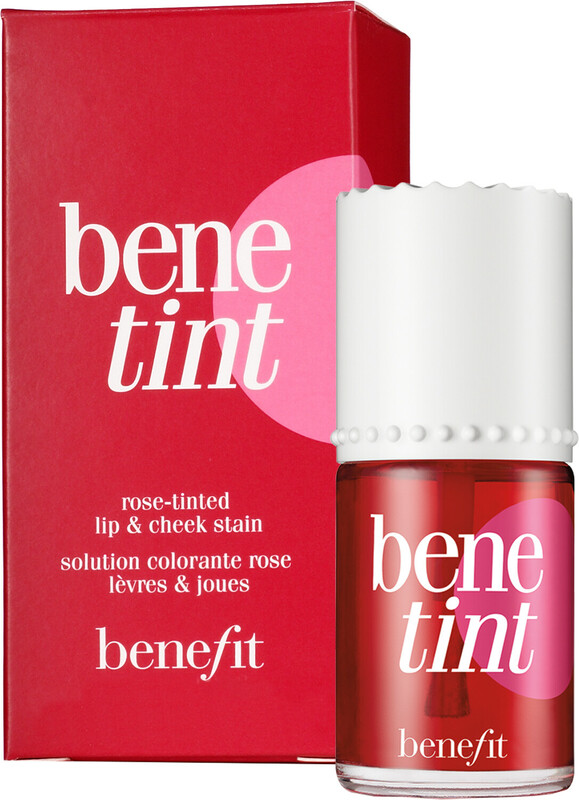 Benefit Benetint - Rose-Tinted Lip & Cheek Stain is rated 4.0 out of 5 by 1. Rated 4 out of 5 by SmokeJunkie from Mini-sized punt The new trial-sized Benefit products are such a great idea as I've always felt non- committal towards the brand, but have been curious about some of their iconic products - like this original Benetint. I didn't have any fixed ideas of what I would use it for as my cheeks are too dry and not smooth enough for cremes (let alone stains) to settle on, and I don't use lipsticks as re-applying is too much hassle. I've tried my Benetint as a cheek stain for non- make-up (ok, I mean "no-make-up make-up") days: I need to build it up in 3 layers for the colour to show through, which is where the rosacea effect happens to me with non-powder cheek products. However, it works nicely as a lip tint on freshly exfoliated lips as the colour will stay on for a few hours and fades slowly and evenly. The liquid has a light rose smell, but it doesn't bother me. I can taste it slightly if I'm not careful with lip application, but it doesn't stain my teeth and I'm not hyper-sensitive to fragrances.